In Part One of our series on those six quarterbacks, we looked at Harry Agganis, the team’s first-round selection in 1952. Part Two featured Bobby Garrett, the first Stanford quarterback taken No. 1 overall in the draft. Today we focus on Mike Phipps, the All-American quarterback from Purdue taken in the first round in 1970. Heading into the 1970 NFL Draft, the Cleveland Browns believed they were in need of a drastic makeover at the quarterback position. 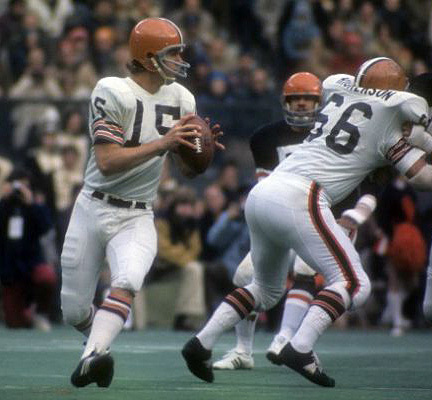 The franchise that was once synonymous with championships had not won a title since 1964, and even though quarterback Bill Nelsen had led the team to the conference championship game in 1968 and 1969 (making the Pro Bowl that latter year), his knees were bad (four surgeries on his right, two on his left) and Browns owner Art Modell decided it was time to get some insurance in case Nelsen went down with a career-ending injury. The problem, from the Browns perspective, is that they did not hold a high enough draft pick to have a chance at one of the top three quarterbacks in the 1970 draft – Louisiana Tech’s Terry Bradshaw, San Diego State’s Dennis Shaw and Purdue’s Mike Phipps. Pesky details like that did not stop a great football mind like Modell, so he went looking for a trade partner, eventually finding one in the Miami Dolphins, who held the third pick in the draft. On the day of the draft, Modell traded future Hall-of-Fame wide receiver Paul Warfield, who had caught 22 touchdown passes over the previous two seasons, to the Dolphins for their first-round pick. The deal was conditional on the Dolphins selecting a quarterback when their turn came up in the first round. Well of course you would give up one of the best wide receivers in the game to select “backup protection” for your quarterback; makes all the sense in the world. And by trading Warfield the Browns opened created a hole at wide receiver that needed filling. The team would eventually trade for Homer Jones, who would play one season, catching 10 passes, for the Browns before retiring. And people still question why Modell is not in the Hall of Fame. This being the Browns, Bradshaw went No. 1 overall to Pittsburgh and would go on to win four Super Bowls with the Steelers. After Green Bay selected Notre Dame defensive tackle Mike McCoy with the second pick, the big moment arrived and the Dolphins selected Phipps on the Browns’ behalf. Phipps was coming off a successful three-year run with the Boilermakers. He led Purdue to three consecutive 8-2 seasons, making him the winningest quarterback in school history at the time. Purdue earned a share of the 1967 Big Ten Championship, finishing ninth in the Associated Press poll. His senior year, he was a unanimous All-America selection and runner-up in the Heisman Trophy balloting while setting school records for passing yards (2,527) and touchdown passes (23). He also became the first quarterback to beat Notre Dame in three consecutive years (for what that is worth). Phipps started one game in each of his first two seasons as the Browns went 7-7 his rookie year (missing the playoffs) and 9-5 his second year, which included a playoff loss to Baltimore. It’s little wonder that Skorich never coached again after being fired by the Browns following the 1974 season. Cleveland returned to the playoffs but Phipps was just nine-of-23 with five interceptions as the Browns lost to the Dolphins, 20-14. That season would turn out to be the highpoint of Phipps’ time in Cleveland. Over the next four years, Phipps would only make 36 starts and throw 25 touchdown passes against 56 interceptions. In 1976, his last year in Cleveland, Phipps was injured in the season-opener against the New York Jets and would only make one additional start that season. While Phipps may not have worked out in Cleveland, the blame doesn’t fall entirely on his shoulders. The core veterans that made up the talented teams from the 1960s were starting to retire, and rather than strategically use the draft to build a team that could grow with his young quarterback, Modell mortgaged the future by trading away high draft picks for players that proved to be little more than afterthoughts in the franchise’s history books. Among the shortsighted deals in the early 1970s were trading a first-round pick and a second-round pick for linebacker Bob Babich; a third-round pick for Don Horn, a 28-year-old backup quarterback who would throw eight passes (completing four of them) in a Cleveland uniform; and a fourth-round pick for Gloster Richardson, who caught 22 passes over three seasons. Just because it needs repeating: there are actually people who believe Art Modell should be in the Hall of Fame. There was a happy ending to Phipps’ tenure in Cleveland, at least as far as the Browns were concerned. On draft day in 1977, the Browns traded Phipps to Chicago for the Bears’ fourth-round choice that year and a first-round choice in 1978 – a pick the Browns used to draft Hall-of-Fame tight end Ozzie Newsome. Phipps would spend five seasons with the Bears, making 20 starts (including a 10-game stretch in 1979 where he was 9-1 and started a playoff game) before retiring following the 1981 season. While professional glory would escape him, Phipps was inducted into the Purdue Intercollegiate Athletics Hall of Fame in 1995 and the College Football Hall of Fame in 2005. As for the Browns, after taking Phipps in the first round in 1970, it would be 19 years before the team would take a chance on another quarterback in the first round. did i ever share these beauties with you? it’s was a separate project but right in that phipps trade vicinity. turns out that wasn’t the only bad deal we were making. “Santa Claus Browns” <–true headline. Oh! and that 1972 playoff loss to the dolphins was as close as anyone came to beating them that year. still the only undefeated team. I was surprised when I looked back at the box score that despite having such a horrible day, Phipps actually had the Browns leading in the fourth quarter. But the defense let the team down. Wonder where we’ve seen that before? I actually learned a little bit more about Phipps, and now have a bit of a different opinion of his time in Cleveland – everything that went wrong wasn’t solely his fault. Yeah, Phipps’ failure may not have solely been his fault, but he still was considered expendable several years later because of Brian Sipe. Also, I heard that the Steelers didn’t want any part of Phipps if they would have lost the coin toss for Bradshaw. In the book The Super 70’s by Tom Danyluk, he interviewed Art Rooney, Jr, and asked him what they would have done if they lose the 70 coin flip with Chicago. He basically told Tom that they probably do what the Bears did and trade out of the #2 pick.